A transient ischemic attack is similar to a stroke; though without permanent damage, it can serve as an important risk factor for stroke. A transient ischemic attack (TIA) is often referred to as mini-stroke and is a transient episode of brain dysfunction caused by ischemia, or loss of blood flow to the brain. TIAs and strokes cause similar symptoms such as paralysis, weakness, numbness, slurred speech, and mental confusion. Unlike a stroke, the symptoms of a TIA can resolve within 24 hours. Treatment is limited. A TIA may be prevented by changes in lifestyle. Having a TIA is a risk factor for future stroke. ischemia: Local disturbance in blood circulation due to mechanical obstruction of the blood supply, such as by a narrowed artery or clot. Example drugs used to prevent future TIAs include anti-coagulant medications, like heparin and warfarin, and anti-platelet medications such as aspirin. A transient ischemic attack (abbreviated as TIA, often referred to as mini stroke) is a transient episode of neurologic dysfunction caused by ischemia—either focal brain, spinal cord, or retinal—without acute infarction (tissue death). TIAs share the same underlying etiology (cause) as strokes: a disruption of cerebral blood flow (CBF). TIAs and strokes cause the same symptoms. Unlike a stroke, the symptoms of a TIA can resolve within a few minutes or 24 hours. Brain injury may still occur in a TIA lasting only a few minutes. Having a TIA is a risk factor for eventually having a stroke or a silent stroke. 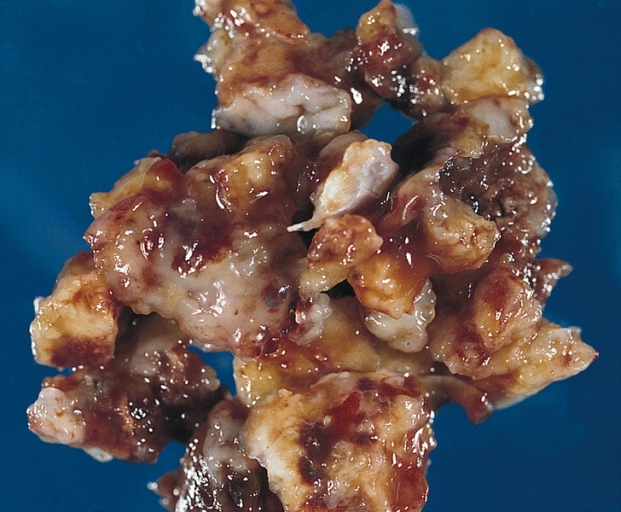 Heart-Great Vessels: Cardiac Myxoma: This image is the left atrial mass of a 71 year old man who had TIAs. numbness or tingling (paresthesia), usually on one side of the body. There have also been cases of temporary and partial paralysis affecting the face and tongue of the afflicted. The symptoms of a TIA are short-lived and usually last a few seconds to a few minutes, and most symptoms disappear within 60 minutes. Some individuals may have a lingering feeling that something odd happened to the body. Dizziness, lack of coordination, or poor balance are also symptoms related to TIA. Symptoms vary in severity. The most common cause of a TIA is an embolus that occludes an artery in the brain. This usually arises from a dislodged atherosclerotic plaque in one of the carotid arteries or from a thrombus (i.e., a blood clot) in the heart because of atrial fibrillation. In a TIA, the blockage period is very short-lived and hence there is no permanent damage. Other reasons include excessive narrowing of large vessels resulting from an atherosclerotic plaque and increased blood viscosity caused by some blood diseases. TIA is related to other medical conditions such as hypertension, heart disease (especially atrial fibrillation), migraine, cigarette smoking, hypercholesterolemia, and diabetes mellitus. Males have a slightly higher risk of TIA than females, but females are more likely to die from a stroke. African Americans generally tend to have a high risk of dying from a stroke, chiefly due to high blood pressure and uncontrolled diabetes. The mainstay of treatment following acute recovery from a TIA should be to diagnose and treat the underlying cause. It is not always immediately possible to tell the difference between a CVA (stroke) and a TIA. Most patients who are diagnosed at a hospital’s emergency department as having suffered from a TIA will be discharged home and advised to contact their primary physician to organize further investigations. A TIA can be considered as the last warning. The reason for the condition should be immediately examined by imaging of the brain. The initial treatment is aspirin, second line is clopidogrel (PLAVIX), third line is ticlopidine. If TIA is recurrent after aspirin treatment, the combination of aspirin and dipyridamole is needed (Aggrenox).